How to determine how many student visits were made to a particular course. How to determine how long student spent visiting a particular course. How to determine how many student visits were made to a each piece of course content (course elements) in a specific course. How to determine how long students spent viewing course content (course elements) in a specific course. On these pages you will find an overview of some of the common reports run by larger customers. We update these pages after reach release. Courses are identified internally by the CourseID. Users will see the CourseTitle and CourseCode. Archived courses are usually historical courses that have ended. The teacher or administrator chooses to archive them and they become 'read only' in itslearning. This status denoted by the IsCourseArchived flag. Courses can be moved to the 'trash can' in itslearning. These courses are shown in the Data Warehouse, are denoted by the CourseStatus flag (which can show 'active' or 'trashcan'). In itslearning these courses can be seen by teachers and administrators, but not students. Once a course is removed from the trash-can is it deleted. Deleted courses still appear in the Data Warehouse denoted by DeletedOn date. We always retain the last version the course. Courses are fundamental to itslearning - nearly all teaching and learning occurs in a course Courses are usually set up to teach a specific subject area, for example, 2nd grade Math or AP Chemistry. Within a course, groups can be created for different periods or abilities. Participants: Courses have course participants (users) who can have one of three roles: Teacher, Pupil (student) or Guest. These are unique to the course allowing teachers to be 'administrators' of one course and a 'student' in another. Course Elements: Courses usually contain teaching and learning resources (e.g. files) and activities (e.g. assessments or tests). Elements have their own entity that details the content. Learning Objectives: a course can have one or more learning objectives added either from the site library or created just for the course by the teacher. Assessment Scale: a teacher can create assessment scales unique to the course for the course elements (activities) to use. Student Grades: Activities (tests, assignments) associated with a course can be assessed by the teacher and given a score/grade. Time in course, course visits: we record both the course visits and an indication of the time spent in a course. Note: 'Student' and 'Pupil' are used interchangeably in the application. To find student information, look for the Pupil profile name. Step 5: Examine the CourseProfileId property of CourseMembership entities to find the Pupils only (based on CourseProfileId from Step 2). We provide data on all users within itslearning. All users (teachers, students, parents) are present. The entity itself contains key data such as name, title, username and status. The entity is linked to several other entities that provide additional information such as users 'type' and, if applicable, their grades, course membership, learning objective mastery. Users can be active (UserStatus = active) and allowed to access itslearning. Users can be in the 'trash can' (UserStatus = tashcan) and not allowed to access itslearning. Users can be in 'deleted' (UserStatus = deleted) and not allowed to access itslearning. Users can be added through an SIS integration or directly though the administrator interface. The 'User' entity has key information about the user such as name, username, date of last login. In addition the entity acts as a link to many different entities that describe the academic progress, learning platform activity and status of the user. Each user has a profile associated with the customer (site). This is their 'SiteProfile'. Users belong to an organisation (e.g. a school in a district). Users can belong to one or more courses shown through the 'CourseMembership' relationship. Users have grades for assessments they have taken show though the 'UserGrade' relationship. Users can have evidence of mastery (understanding) learning of learning objectives through the 'LearningObjectiveProgress' relationship. Users can be assessed in learning objectives through the 'LearningObjectiveAssessment' relationship. We track the user's access to itslearning though the 'UserSession' relationship. We track the user's access to courses through the 'UserCourseSession' relationship, and to elements through 'UserElementSession'. itslearning tracks user visits to courses and course content (course elements), the time periods are also tracked allowing visit duration to be approximated. Due to the nature of internet sessions the time a user visits a course or piece of course content is accurate, however, the duration is best thought of as an indicator. Users can open multiple pages (tabs) in a browser, may leave pages open without actually viewing them, or forget to close or log out. UserCourseSessions: Describes the time periods of user visits to courses. UserElementSession: Describes the time periods of user visits to course content. Date: Gives details when actions, events, or calculations took place. H ow to determine how many student visits were made to a each piece of course content (course elements) in a specific course. Students are assessed in the test tool, assignment tool, task tool, through external tools and by a 'manual assessment' added to the grade book. Assessments are linked to the the course they was created in, an assessment scale, the term in which the assessment occurred and the type of assessment. When a student is assessed in an assignment, test, or other activity the 'Score' is recorded in this entity. This numeric 'Score' can be mapped to a meaningful grade (e.g. A+, Pass, Merit) through the 'AssessmentGrade' relationship. The status of the grade (e.g. completed) is know from the 'AssessmentStatus' relationship. 'UserGrades' are always associated with a course. Learning objectives (standards) are statements that define the expected goal of a course, lesson or activity in terms of demonstrable skills or knowledge that will be acquired by a student. They allow teachers to better define outcomes for students. Students can be asked to demonstrate understanding / mastery of the learning outcomes. The national repository for the whole country or state. These are added to the repository by itslearning (in consultation with customers and national organisations). Each has a unique identifier. Customer (site) repository. Each customer can add their learning objectives to a local repository. Course-level learning objectives. Teachers can choose from the national or customer learning objectives or add their own for use in a specific course. We recommend that cross-course learning objectives are added to the customer (site) repository. Learning objectives are usually shown in a folder structure, divided into focus areas. In the data warehouse the LearningObjective entity stores the name and identifier of the learning objectives. These are then related to the Course(s) where they are used. Many course elements can be mapped to (associated with) one or more learning objectives. Learning objectives can be chosen from the global (national) repository, the customer (site) repository, or the teacher can create a learning objectives use in their course and map it to a course element. If a learning objective is added to a plan, any resource added to the plan automatically is assigned the learning objectives. The learningObjectiveAssessment entity records the assessments of individual learning objectives. It is updated when a teacher assesses a student's work that is related to a learning assessment. It holds key data such as the percentage score and date of assessment. It is related to the course where the assessment took place ('CourseID'), the learning objective ('LearningObjectiveId') and the element (tool) in the course where the assessment occurred ('CourseElementId'). Customers can set up their own definition of standards mastery. Customers can set-up mappings between the learning objective percentage score and a friendly label such as 'Working towards', or 'Understands'. 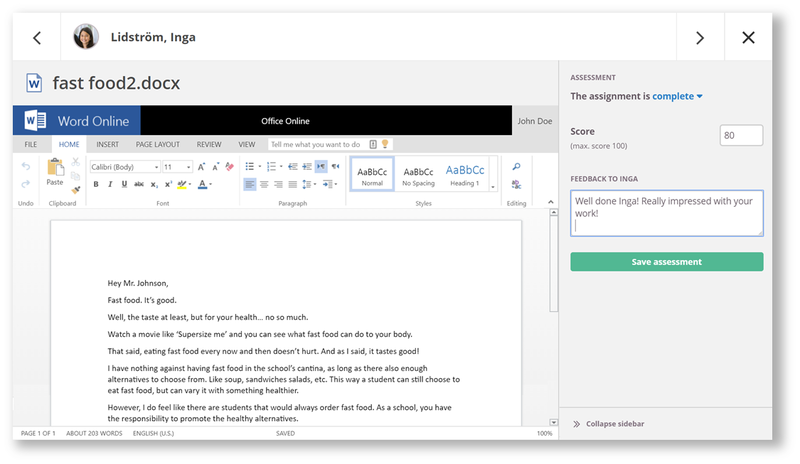 This provides an friendly description to be seen by students in the learning platform, while allowing itslearning to store a single percentage grade.